The temperatures are rising and the sun is shining which means it's officially time to embrace the hot summer days ahead. I don't know about you, but I like to switch things up a bit in the summer. 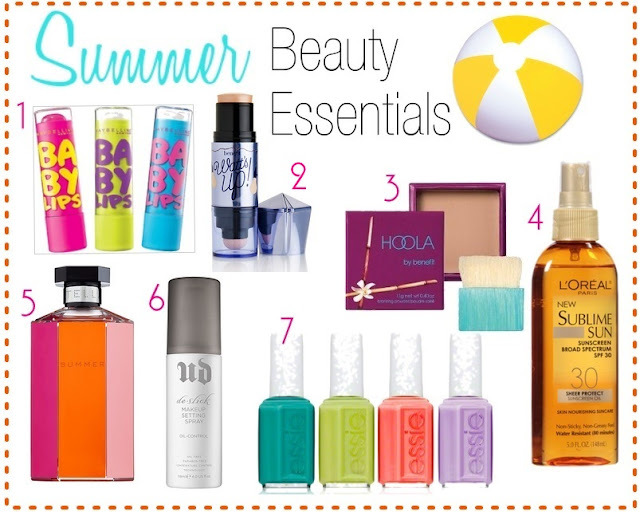 My essentials call for a fuss-free face, with plenty of sunblock, a bright mani, a beachy fragrance. Here are some of my favorite beauty essentials to beat the heat. What are yours? I love those bright lip balms! I keep finding myself going for the NYC Applelicious lip balm this summer that I got in my Voxbox. I love it! I love baby lips, perfect for the summer! That sunscreen oil sounds great, I am definitely going to have to try it. I have actually been using sunscreen for kids (its the only kind I have in the house right now) and it hasn't been leaving those white streaks.